http://hfunderground.com/blog/wp-content/uploads/2014/12/VO-Oromo-Liberation-1701z-12-24-14-17630khz.mp312/24/14 *1701z Voice of Oromo Liberation in Oromo to Ethiopia 17630khz – fair to good – here’s 1st 3mins of open. This entry was posted in Clandestine on December 24, 2014 by fpeconsultant. Used USB due to AWR on 17575 – helped a lot. Open with music into OM in Somali. Considering the multiple mentions of Somalia during the show, I’m guessing this is targeted there – not sure of Xmitting site. Off about 1729 after music. Here’s the open & the close. Yes, I’m about 11 months late in getting this out… but better late than never! Your comments are certainly appreciated, as well as suggestions for additional data you’d like to see for 2014. 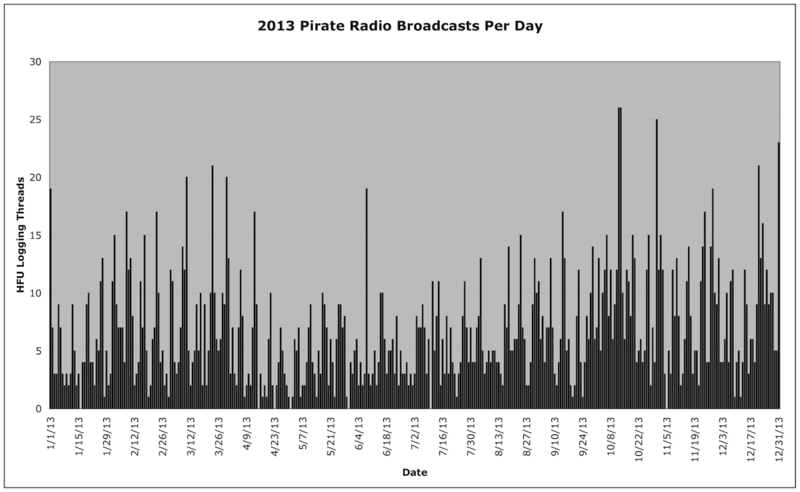 To gauge shortwave pirate radio activity in 2013, I analyzed the loggings to the HF Underground (http://www.hfunderground.com) message board. A computer script parsed the message thread titles, as well as the timestamps of the messages. 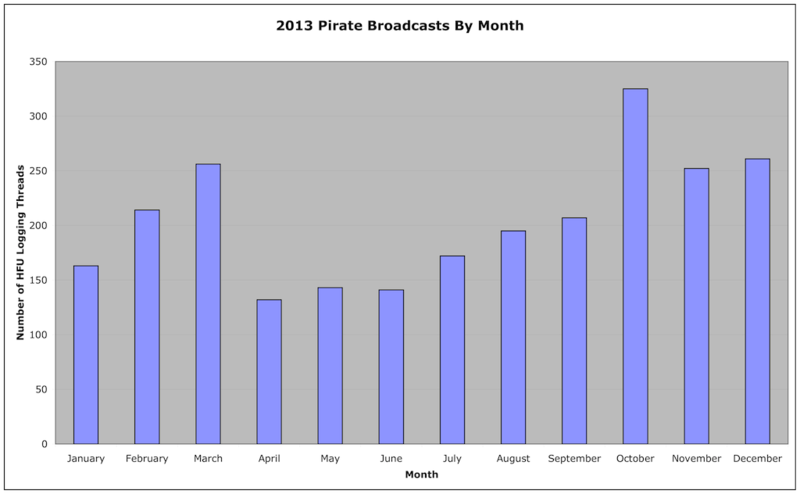 This information was used to produce some statistics about the level of pirate radio activity. Of course, as Mark Twain has written: “There are three kinds of lies: lies, damned lies, and statistics.” Still, let’s see what we can learn. There were 14,287 messages posted to 2,461 unique threads, that’s a 64% increase in the number of messages over 2012. Ideally, each thread represents an individual pirate station transmission. Also ideally, each message posted to a thread represents one logging. In reality, there is some error involved. AM and USB are virtually tied, and if we assume (as likely) that the cases where no mode was reported are one of these, account for virtually all of the transmission. SSTV was broken out just to show about how many SSTV transmissions there are, these of course are almost all transmitted in USB mode. Also, these are cases where SSTV is in the logging title, which means that the transmission was probably just SSTV, vs a station that also happened to transmit SSTV as part of the program. As one might expect, Saturday and Sunday are the big winners, with Friday in third place. But don’t give up on weekday listening! 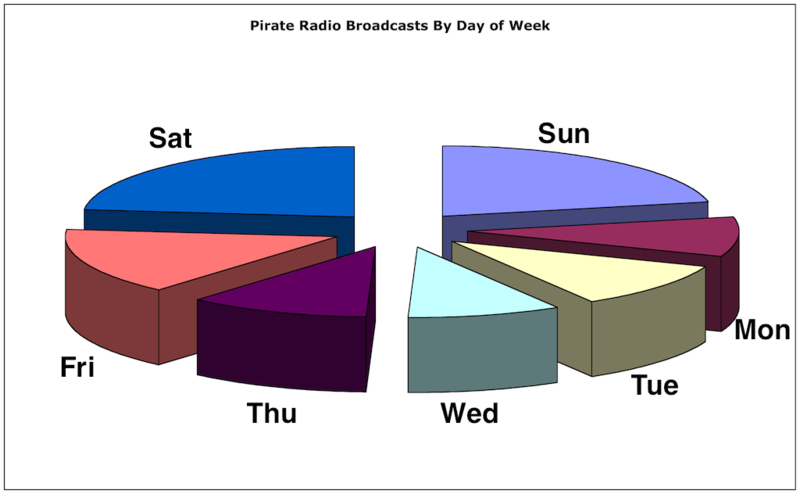 39% of transmissions are on a Monday through Thursday. Since the overall popularity of the HF Underground continues to grow, there is possibly some inflation in the number of threads as the year goes on. As you might expect, evening Eastern Time is the best, roughly 2300-0300 UTC, with a broader peak of lower activity from roughly 2000-0500 UTC. There is some activity in the morning to afternoon time period, and very little during the wee hours. 6925, along with 6924 and 6926 kHz, account for 60% of logged transmissions. The most popular station logged is of course “UNID”, short for unidentified. 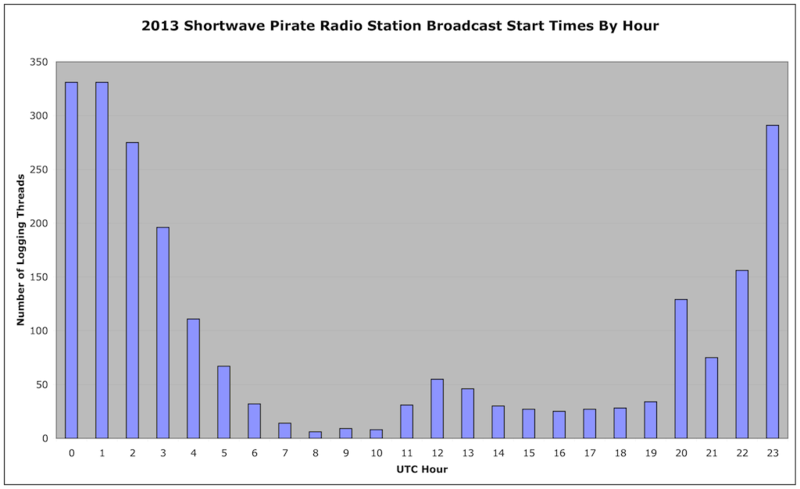 In the world of shortwave pirate radio, there’s a number of transmissions where no ID is given. There’s also many cases where no ID could be heard, due to poor conditions. For 2013, there were 677 threads with 2,554 loggings where no station ID was given – that’s almost 28% of the threads. This entry was posted in Pirate Radio on December 22, 2014 by Chris Smolinski.